March 13, 1866 - The Civil Rights Act of 1866 is passed by Congress, the first federal law protecting the rights of African Americans. It is vetoed by President Johnson, but the veto overridden by Congress. 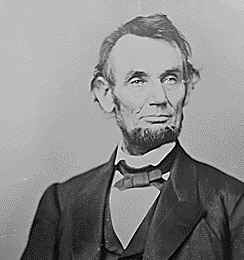 The Thirteenth Amendment to the Constition, banning slavery and involuntary servitude, except in the case of punishment for a crime, had been passed by Congress and enough states to be enacted on December 18, 1865. However, there was much work to be done to provide clarity on what that meant and how the Civil Rights of those now free would be provided. When the federal government took up the issue the next year, the same arguments about state versus federal rights would come into play. President Andrew Johnson, a southern Democrat chosen by Lincoln as a running mate during his second election campaign to attempt to heal the nation still involved in war, believed in state's rights. 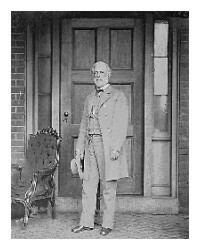 Johnson had been the only Senator from a southern state to remain loyal to the Union during the Civil War. Congress, now without the not yet reinstituted states of the south, had other ideas, and worked on legislation for Civil Rights that would put a federal spin on that question. 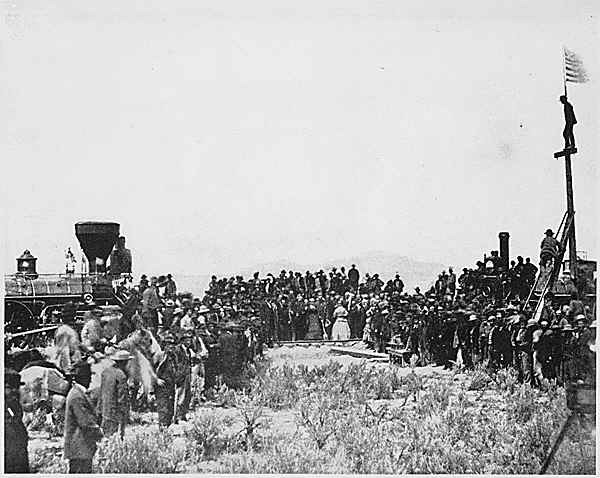 The act would quickly pass both houses of Congress, despite protestation about the states rights issue. It would be just as quickly vetoed by the President. 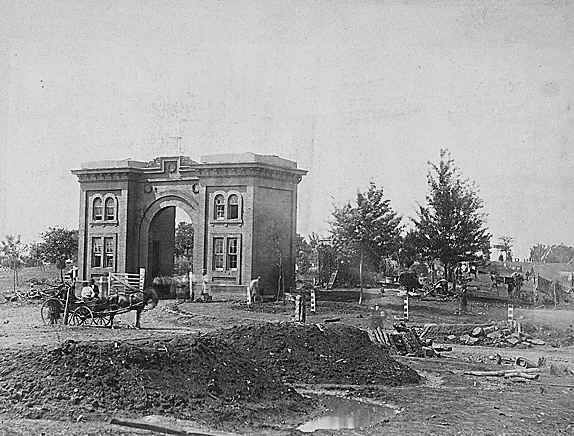 Even after both the House of Representatives and the Senate overrode President Andrew Johnson's veto, doubts about the Act continued. Supporters of the bill wondered whether subsequent legislatures and Presidents could weaken its effect, or whether it would pass constitutional muster, therefore, when the Fourteenth Amendment to the Constitution was written, and passed in 1868, it included a Citizenship Clause as its first sentence, "All persons born or naturalized in the United States, and subject to the jurisdiction thereof, are citizens of the United States and of the State wherein they reside," which paralleled that in the Civil Rights Act of 1866. 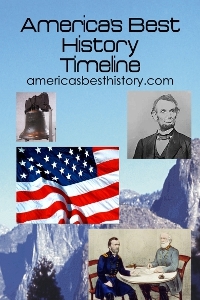 January 5, 1866 - Act introduced by Illinois Senator Lyman Trumball, Judiciary Chairman. February 2, 1866 - Civil Rights Act of 1866 passes the Senate 33-12. No Democrats vote for the bill. They represented the states of Delaware, Kentucky, New Jersey (1 Senator), California (1), Indiana (1), Minnesota (1), Oregon (1), and Pennsylvania (1). Republicans pass the measure 33-2 with two abstentions. March 13, 1866 - Act passes the House of Representatives 111-38. Thirty-four Congressman do not vote on the bill. No Democrats (32) voted for the bill; eight abstained. 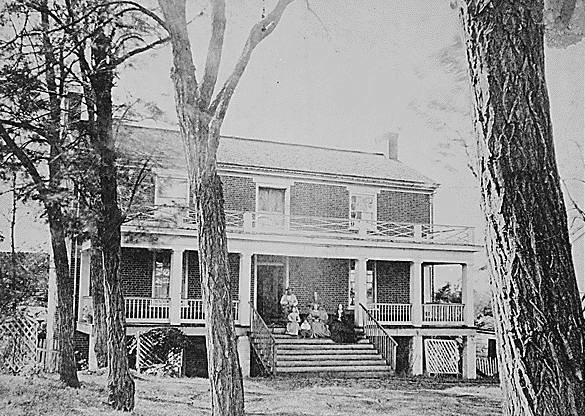 One noted Republican yes; Thaddeus Stevens of Pennsylvania, who had championed the Emancipation Proclamation and Thirteenth Amendment, as well as owned the Caledonia Forge burned by Confederates west of Gettysburg as well as the home of Mary Thompson, used as General Robert E. Lee's headquarters during the Battle of Gettysburg. March 27, 1866 - President Andrew Johnson sends letter to Senate stating his objection and vetoes the Civil Rights Act of 1866, thinking that it was federal intrusion into states rights. Johnson would veto legislation twenty-nine times, with the highest percentage of overrides in history, fifteen of those twenty-nine. This discord with Congress would lead to his impeachment. April 6, 1866 - Senate overrides the veto with a 2/3 majority, 33 to 15. April 9, 1866 - United States House of Representatives overrides the veto of President Andrew Johnson, 122 to 41, with nearly unanimous Republican support. Twenty-one Congressman do not vote on overriding the veto. The bill, having passed both houses with over 2/3 majority, therefore, override the veto and the Civil Rights Act of 1866 becomes law. This was the first time a presidential veto was overrideen on a major piece of legislation. SEC. 2. - And be it further enacted, That any person who, under color of any law, statute, ordinance, regulation, or custom, shall subject, or cause to be subjected, any inhabitant of any State or Territory to the deprivation of any right secured or protected by this act, or to different punishment, pains, or penalties on account of such person having at any time been held in a condition of slavery or involuntary servitude, except as a punishment for crime whereof the party shall have been duly convicted, or by reason of his color or race, than is prescribed for the punishment of white persons, shall be deemed guilty of a misdemeanor, and, on conviction, shall be punished by fine not exceeding one thousand dollars, or imprisonment not exceeding one year, or both, in the discretion of the court. SEC. 3. - And be it further enacted, That the district courts of the United States, within their respective districts, shall have, exclusively of the courts of the several States, cognizance of all crimes and offences committed against the provisions of this act, and also, concurrently with the circuit courts of the United States, of all causes, civil and criminal, affecting persons who are denied or cannot enforce in the courts or judicial tribunals of the State or locality where they may be any of the rights secured to them by the first section of this act; and if any suit or prosecution, civil or criminal, has been or shall be commenced in any State court, against any such person, for any cause whatsoever, or against any officer, civil or military, or other person, for any arrest or imprisonment, trespasses, or wrongs done or committed by virtue or under color of authority derived from this act or the act establishing a Bureau for the relief of Freedmen and Refugees, and all acts amendatory thereof, or for refusing to do any act upon the ground that it would be inconsistent with this act, such defendant shall have the right to remove such cause for trial to the proper district or circuit court in the manner prescribed by the "Act relating to habeas corpus and regulation judicial proceedings in certain cases," approved March three, eighteen hundred and sixty-three, and all acts amendatory thereof. The jurisdiction in civil and criminal matters hereby conferred on the district and circuit courts of the United States shall be exercised and enforced in conformity with the laws of the United States, so far as such laws are suitable to carry the same into effect; but in all cases where such laws are not adapted to the object, or are deficient in the provisions necessary to furnish suitable remedies and punish offences against law, the common law, as modified and changed by the constitution and statutes of the State wherein the court having jurisdiction of the cause, civil or criminal, is held, so far as the same is not inconsistent with the Constitution and laws of the United States, shall be extended to and govern said courts in the trial and disposition of such cause, and, if of a criminal nature, in the infliction of punishment on the party found guilty. SEC. 4. 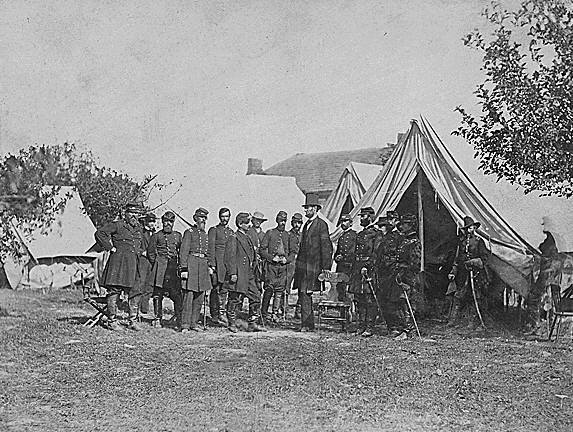 - And be it further enacted, That the district attorneys, marshals, and deputy marshals of the United States, the commissioners appointed by the circuit and territorial courts of the United States, with powers of arresting, imprisoning, or bailing offenders against the laws of the United States, the officers and agents of the Freedmen's Bureau, and every other officer who may be specially empowered by the President of the United States, shall be, and they are hereby, specially authorized and required, at the expense of the United States, to institute proceedings against all and every person who shall violate the provisions of this act, and cause him or them to be arrested and imprisoned, or bailed, as the case may be, for trial before such court of the United States or territorial court as by this act has cognizance of the offence. And with a view to affording reasonable protection to all persons in their constitutional rights of equality before the law, without distinction of race or color, or previous condition of slavery or involuntary servitude, except as a punishment for crime, whereof the party shall have been duly convicted, and to the prompt discharge of the duties of this act, it shall be the duty of the circuit courts of the United States and the superior courts of the Territories of the United States, from time to time, to increase the number of commissioners, so as to afford a speedy and convenient means for the arrest and examination of persons charged with a violation of this act; and such commissioners are hereby authorized and required to exercise and discharge all the powers and duties conferred on them by this act, and the same duties with regard to offences created by this act, as they are authorized by law to exercise with regard to other offences against the laws of the United States. SEC. 5. - And be it further enacted, That it shall be the duty of all marshals and deputy marshals to obey and execute all warrants and precepts issued under the provisions of this act, when to them directed; and should any marshal or deputy marshal refuse to receive such warrant or other process when tendered, or to use all proper means diligently to execute the same, he shall, on conviction thereof, be fined in the sum of one thousand dollars, to the use of the person upon whom the accused is alleged to have committed the offence. And the better to enable the said commissioners to execute their duties faithfully and efficiently, in conformity with the Constitution of the United States and the requirements of this act, they are hereby authorized and empowered, within their counties respectively, to appoint, in writing, under their hands, any one or more suitable persons, from time to time, to execute all such warrants and other process as may be issued by them in the lawful performance of their respective duties; and the persons so appointed to execute any warrant or process as aforesaid shall have authority to summon and call to their aid the bystanders or posse comitatus of the proper county, or such portion of the land or naval forces of the United States, or of the militia, as may be necessary to the performance of the duty with which they are charged, and to insure a faithful observance of the clause of the Constitution which prohibits slavery, in conformity with the provisions of this act; and said warrants shall run and be executed by said officers anywhere in the State or Territory within which they are issued. SEC. 6. - And be it further enacted, That any person who shall knowingly and wilfully obstruct, hinder, or prevent any officer, or other person charged with the execution of any warrant or process issued under the provisions of this act, or any person or persons lawfully assisting him or them, from arresting any person for whose apprehension such warrant or process may have been issued, or shall rescue or attempt to rescue such person from the custody of the officer, other person or persons, or those lawfully assisting as aforesaid, when so arrested pursuant to the authority herein given and declared, or shall aid, abet, or assist any person so arrested as aforesaid, directly or indirectly, to escape from the custody of the officer or other person legally authorized as aforesaid, or shall harbor or conceal any person for whose arrest a warrant or process shall have been issued as aforesaid, so as to prevent his discovery and arrest after notice or knowledge of the fact that a warrant has been issued for the apprehension of such person, shall, for either of said offences, be subject to a fine not exceeding one thousand dollars, and imprisonment not exceeding six months, by indictment and conviction before the district court of the United States for the district in which said offence may have been committed, or before the proper court of criminal jurisdiction, if committed within any one of the organized Territories of the United States. SEC. 7. - And be it further enacted, That the district attorneys, the marshals, their deputies, and the clerks of the said district and territorial courts shall be paid for their services the like fees as may be allowed to them for similar services in other cases; and in all cases where the proceedings are before a commissioner, he shall be entitled to a fee of ten dollars in full for his services in each case, inclusive of all services incident to such arrest and examination. The person or persons authorized to execute the process to be issued by such commissioners for the arrest of offenders against the provisions of this act shall be entitled to a fee of five dollars for each person he or they may arrest and take before any such commissioner as aforesaid, with such other fees as may be deemed reasonable by such commissioner for such other additional services as may be necessarily performed by him or them, such as attending at the examination, keeping the prisoner in custody, and providing him with food and lodging during his detention, and until the final determination of such commissioner, and in general for performing such other duties as may be required in the premises; such fees to be made up in conformity with the fees usually charged by the officers of the courts of justice within the proper district or county, as near as may be practicable, and paid out of the Treasury of the United States on the certificate of the judge of the district within which the arrest is made, and to be recoverable from the defendant as part of the judgment in case of conviction. SEC. 8. - And be it further enacted, That whenever the President of the United States shall have reason to believe that offences have been or are likely to be committed against the provisions of this act within any judicial district, it shall be lawful for him, in his discretion, to direct the judge, marshal, and district attorney of such district to attend at such place within the district, and for such time as he may designate, for the purpose of the more speedy arrest and trial of persons charged with a violation of this act; and it shall be the duty of every judge or other officer, when any such requisition shall be received by him, to attend at the place and for the time therein designated. SEC. 9. 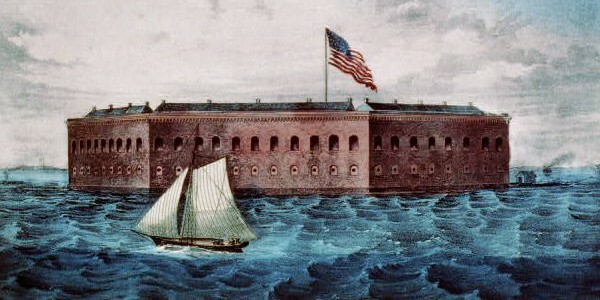 - And be it further enacted, That it shall be lawful for the President of the United States, or such person as he may empower for that purpose, to employ such part of the land or naval forces of the United States, or of the militia, as shall be necessary to prevent the violation and enforce the due execution of this act. SEC. 10. - And be it further enacted, That upon all questions of law arising in any cause under the provisions of this act a final appeal may be taken to the Supreme Court of the United States. 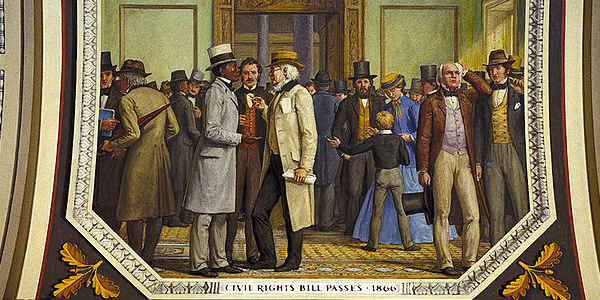 Image above: Oil Mural on Canvas in the House Corridor of the U.S. Capitol, Civil Rights Bill Passes 1866, Allyn Cox, 1973-4, Architect of the Capitol. Courtesy Wikipedia Commons. 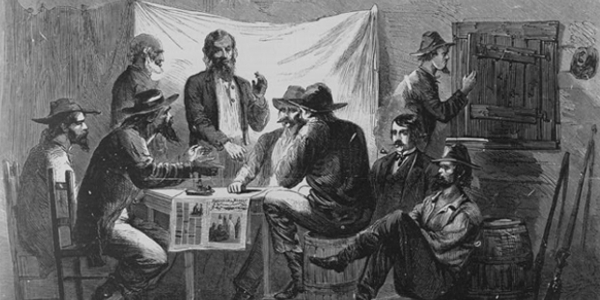 Image below: Wood engraving of a Meeting of Southern Unionists, 1866, Alfred Waud. Courtesy Library of Congress. Info source: House.history.gov; Senate.gov; govtrack.us; Architect of the Capitol; Wikipedia Commons.